While a do-it-yourself tattoo might not sound like a great idea, stick and poke tattoos are actually trending. This simplistic tattoo takes few tools, but if not done correctly, it might be a tat you regret. What Is Stick and Poke Tattooing? Tattooing is an art form that has been around for thousands of years. For example, tattoos were found on a 5,200-year-old Maori mummy. Since they didn't have a gun or electricity to do them, it only makes sense that they used the stick and poke method. A stick and poke tattoo is exactly what the name suggests. Using a needle (the stick), the skin is poked, leaving ink behind. The ink stays in the skin, creating the desired design. You'll often also hear of this type of tattoo called a hand tattoo or even a DIY tattoo. While stick and poke tats can come in simplistic designs, this method is used in some cultures to create elaborate designs. A stick and poke tattoo is done with something sharp and some ink. While the range of tools isn't limited, it is important to use a sterile needle to avoid infection. While a sterile tattoo needle would be recommended, some choose to use a sterilized sewing needle (these are not recommended because they are much wider than tattoo needles). Additionally, non-toxic tattooing inks work best with the skin. This will give the tattoo staying power and help you to avoid reactions. Now that you know what tools are used, it's time to understand the process itself. First, you'll want to have the design. You can either have a design ready or you can choose to freehand the piece, but having a design ready and waiting is usually the best option to avoid mistakes and to give your tattoo a unique spin. Creating the stick and poke tattoo is simply a process of dipping the needle into the ink and penetrating the skin repeatedly to achieve the desired design. DIY tattoos are painful. There is not a way around that. Unlike a traditional tattoo gun that is set for a specific depth or speed, stick and poke methods are at the mercy of the creator. The depth they go is also up to their discretion. Therefore, each poke is slightly different than the last. Additionally, since this is a single needle, creating an elaborate or large design takes days, hours and even months. Pain will also come into play depending on where you choose to place the said piece because some areas are more painful than others. Stick and poke tattoos are permanent; however, they can fade much faster than a traditional tattoo-gun created piece. The rate of the fading has a couple variables that must be considered. The depth that the artist placed the ink will affect the fade rate of the tat. Generally, your run-of-the-mill tat will go into the dermis layer of the skin. This means it will go beyond the epidermis' five layers and into the dermis (about 1-2 mm), but if your stick and poke artist goes too shallow, the ink will simply bleed from the tat during the healing process. The type of ink that was used to create the permanent art will play into its staying power. Cheap or homemade 'ink' will fade much faster than high quality tattooing ink. As is true of any tat, placement is a consideration in permanence. Tattoos that are in areas that see a lot of sun or that shed more skin cells (like the hands) will fade more quickly. If you're considering getting a stick and poke style tattoo, it's best to get one from a professional artist with a clean studio. There are a number of health risks associated with attempting to do these at home. According to UW Health, there are dangers associated with doing these yourself (or getting one from a friend), including Hepatitis B or C, HIV, tetanus, and serious infections. Other risks include staph infections, Cellulitis (a bacterial infection that can spread rapidly), or allergic reactions. 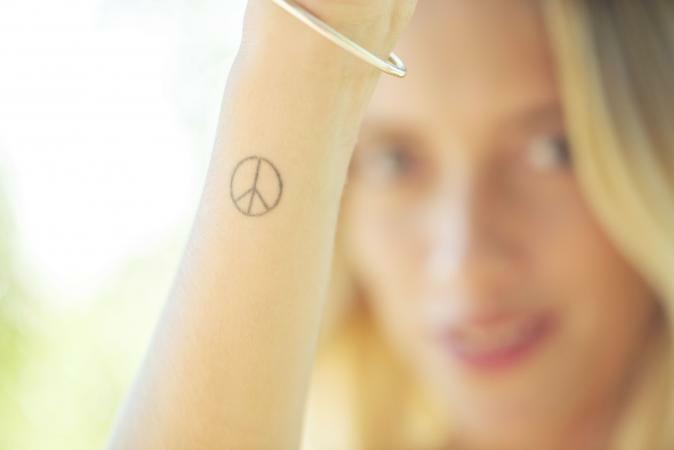 Stick and poke tattoos are fairly easy to create. They can be done with a sharp object and some sort of inking agent. However, to avoid infection, it is important to use sterile equipment and inks that are designed for the skin. It's best to get one done from a professional. Additionally, stick and poke tats are permanent, so you might want to consider your options before beforehand.